Drake is gifted at many things - rapping, random acts of kindness, bringing back cancelled TV shows. But, for many football fans, he's also becoming a bit of a pain. Paris Saint-Germain's Layvin Kurzawa is the latest footballer to pose for a photo with the Canadian star and have his team lose their very next game. PSG's spectacular 5-1 loss to Lille has reignited suspicions that Drake, while obviously multi-talented, is a curse on every sports star he meets. And AS Roma want nothing to do with it. 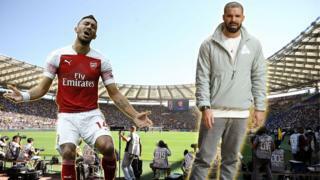 Obviously Roma are joking, but a number of clubs across England and Europe might be wishing they'd banned their players from posing for pictures with Drake over recent weeks. Paul Pogba saw Drake perform at the Manchester Arena and got a picture taken with him - not long before Manchester United lost 2-1 to Wolves in the FA Cup. It was a similar story for Arsenal's Pierre-Emerick Aubameyang, who was at one of Drake's seven shows at the O2 in London. After losing 1-0 to Everton the following weekend, plenty of Gooners will probably be wishing he'd never posed for a picture. Sergio Aguero is the third Premier League player people think Drake has cursed in recent weeks. He missed a penalty in the Champions League as Man City lost 1-0 to Tottenham earlier this month, not long after he'd been photographed with Drake at a show. In 2015 Serena Williams was trying to become the first woman to win all four tennis Grand Slams in a calendar year since Steffi Graf did it in 1988. But 2015 was also the year that Drake was spotted watching a lot of her games. Roberta Vinci was a 300-1 underdog when she faced Serena in the US Open - but we're pretty sure by now you can guess what the outcome of the match was. And if you still need more evidence, last year Conor McGregor tapped out in the fourth round of his fight against Khabib Nurmagomedov.Any guesses who he'd been hanging out with beforehand?